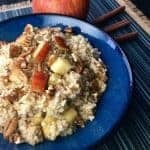 To serve, allow cooling slightly before spooning into bowls and topping with fresh chopped apples, pecans, and some real maple syrup if desired. Important Tips: Do not substitute any other type of oats for this recipe. Cooking times are based on using steel cut oats only. It very important to either line or heavily grease the sides of your slow cooker crock before preparing this recipe. If you skip this step, the oats will stick to the sides and will be very difficult to remove.